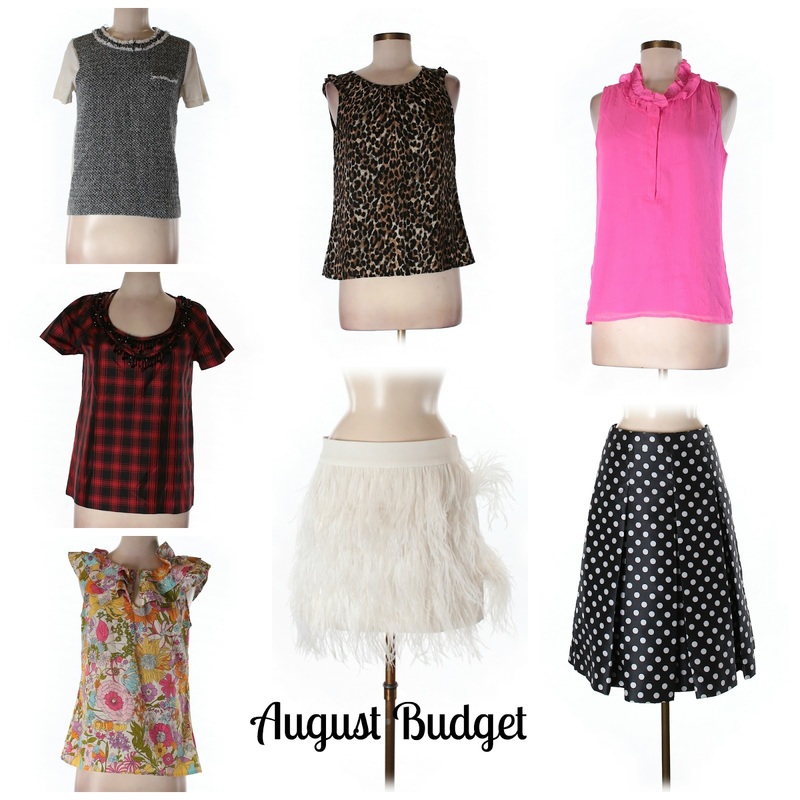 It's time for my August budget post. I only shopped at ThredUp this month. You can read about my experience buying and selling with them here. Since this is all sold I'm going to point you towards some similar items. 1. J.Crew Tweed Tee (similar) I haven't worn this yet but I see myself getting a lot of use out of this. I think it's a really cool tee-shirt. 2. Loft Leopard Blouse (similar) Like I said in my review I already have this blouse it's just too small. I've worn the other one a ton and now that I have one that fits I'll be able to wear more leopard! 3. J. Crew silk blouse (similar), I love the color and the neck detail. I've worn it with olive pants. 4. J. Crew Plaid Tee (similar) This screams fall to me so I haven't worn it yet but I am already thinking of things to pair it with once it cools down. 5. Liberty Floral top (similar) I love the neckline detail on this one too. 6. Club Monaco Feather skirt (similar) Like I said in my review this is a little tight but I'm holding on to it because I've been wanting a feather skirt for a long time and it was a good deal. I'm trying to be very thoughtful with my purchases but since I'm working out more I don't think it'll be too tight for long. 7. Halogen Polka Dot skirt (similar) I've worn it here. I think the length of this is just perfect for me. It will go with so much. Normally I break I list the price of everything indivuadlly but I had a coupon. Then I had a credit from selling that was just taken off the total I'm just giving the grand total. For 7 pieces I paid $68.78! Ooo you got some great pieces! Great selections! I love the black and white dotted skirt!